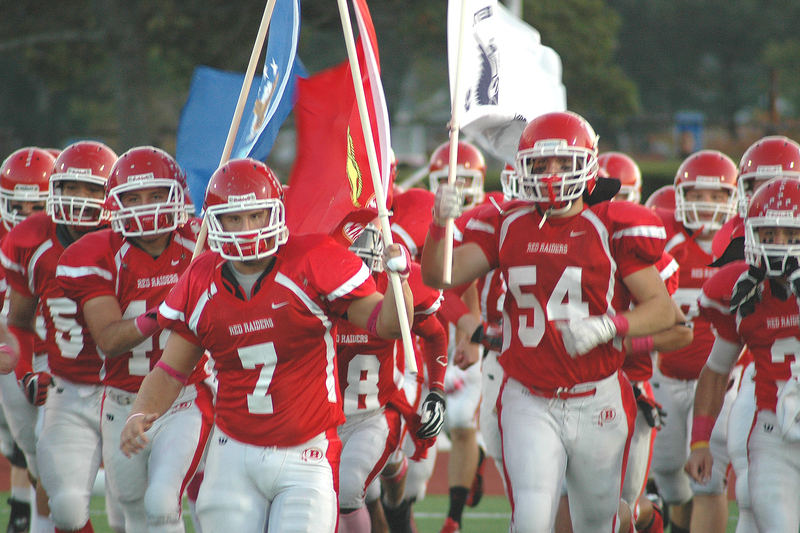 BHS senior captains Andrew Ellis and Bryan Hardy lead the way for the Red & White. Thank goodness for Tedaro France. The senior Barnstable High wide receiver and defensive back staged a phenomenal performance last night, catching touchdown passes of 95 and 61 yards and had 167 yards receiving; on what turned out to be New Bedford’s last offensive play of the game, he tacked on an interception. If not for France’s stellar night, things might have turned out differently for the Red Raiders. As it stood, however, Barnstable maintained its unblemished record and top state ranking at 5-0 with a 19-14 finale over the visiting Whalers (2-3). Senior captain and quarterback Nick Peabody went 12-28 in the air and amassed 299 yards for three touchdowns with one interception. With starting offensive guard Billy Grimmer sidelined after fracturing his fibula in practice Wednesday, Peabody found himself under more pressure than he’s been used to and was sacked five times by a gutsy, rough-and-tumble New Bedford defense. On the ground, Barnstable ran the ball 27 times for just 26 yards on the evening, with Peabody notching the longest run of the night, a 24-yarder on the last play of the first half. It looked like business as usual for Barnstable at the outset of this nailbiter, as Peabody hit a wide-open Dylan Morris on a 34-yarder for his 10th touchdown reception of the season at 8:58 of the 1st quarter to make it 6-0. Senior kicker and linebacker Terrence Mudie, whose opening kickoff was his best of the still young season, planted the PAT kick through the uprights to make it 7-0. Mudie would also block a punt and collect four tackles before suffering a knee injury in the second quarter. He returned to the field only to go down once again and carried off the field. Ahead 7-0, Barnstable exchanged punts with New Bedford until the Red Raiders found themselves with a 1st & 10 on their own five-yard line with 3:53 left to go in the first half. Peabody found France down the middle, flying like the wind as he outran the Whalers’ defense for a 95-yard touchdown. It was the 4th longest touchdown pass play in Red Raider history. But with Mudie out, Barnstable was forced to go for the two-point conversion and it failed, leaving the score at 13-0. Sensing opportunity, perhaps, New Bedford staged a 10-play drive downfield, eventually scoring when senior captain Mike Rapoza found Mike Lajoie down the middle for a 20-yard touchdown. Rapoza’s PAT kick was good and with 0:36 left in the 1st half, Barnstable enjoyed a slim margin of 13-7. New Bedford had a chance to even the score or go ahead when it picked off a Peabody throw and returned it close to 30 yards, but a penalty brought the ball back across the 50 and both teams ended up swapping punts until just 3:36 remained in the game. Both teams attempted to run the ball and in so doing run the clock down – and the plan worked for both teams, to a degree, until the New Bedford defense was lulled into thinking that Barnstable might scrap the passing attack. Not so. Peabody found France wide open down the middle once again, this time for a 61-yard strike to make it 19-7. The Red & White’s two-point PAT failed again and New Bedford had minimal time to try and come back. In what appeared to be either an onside kick attempt or just an errant kickoff, New Bedford returned the ball all the way to the Barnstable 10 and Rapoza then found Lajoie from 7 yards out. With the score at 19-13, Rapoza again booted it through the uprights to make it 19-14. But that would be all the gas New Bedford had left in the tank as it tried one final drive with about 1:20 to go. Rapoza looked down the middle but France swarmed inside his man and snatched the ball from midair to seal the Barnstable victory. Next Friday night, Barnstable heads to Darmtouth high for the Red Raiders’ first Old Colony League contest. Game time is 7:00 pm. A fine defensive effort was also turned in by inside linebackers Bryan Hardy and Andrew Ellis – once again – Ryan Litchman and Derek Estes in the secondary and Mudie prior to leaving the game at halftime. Rob Stuart and Jon Eldredge also fared well, with both players recording a sack.